Franklin Patrick Herbert, Jr. (1920-1986) was raised as Catholic but as adult he turned to Zen Budism. Interesting about Frank is that he didt graduate from college because he wanted to study only what interested him and so did not complete the required courses. He was alredy known and affirmed American science fiction author when he wrote this masterpiece, anthology of Science Fiction, and by many critics the best SF novel of all times. Dune is enchanting, from sands of Arrakis to the seas of Caladan, story across millennia. Writters determination and freedom of mind gave him ability to span his story arcs precisley and with no effort. 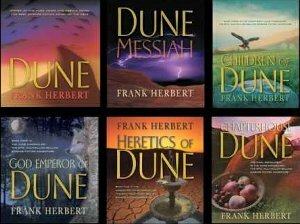 In these books lies wonderfull world of dune: Dune (1965), Dune Messiah (1970), Children of Dune (1976), God Emperor of Dune (1981), Heretics of Dune (1984), Chapterhouse: Dune (1985). Research before first Saga book lasted six years and it just shows, behind every dune of Arakkis. Sandworld where sandworms produce spice trough unknown process. Guess what all universe depends on spice. Spice is mind opener and fastest traveler. Trow in royalty some religion, revolution and you have some idea how great this work is. Frank Herbert was also known as great visionary of his time, he percieved some processes in society which show in all his novels and his quotes. In all his work he had implemented long time strategy and vision never seen before. Topics like strugle for power, politics, army, interest, religion, immortality drug and in same time on other side ecology, economy, balance of life, longterm survival. He pointed out many times he doesnt have many answers but has lots of good questions. About science fiction he says: Humans tend not to see over a long range. Now we are required, in these generations, to have a longer range view of what we inflict on the world around us. This is where, I think, science fiction is helping. I dont think that the mere writing of such a book as Brave New World or 1984 prevents those things which are portrayed in those books from happening. But I do think they alert us to that possibility and make that possibility less likely. They make us aware that we may be going in that direction. And we are getting there surely. So while there is still time read these, truly great books. anonymous: "perfect books, great motion picture, maybe, just maybe best of science fiction left non recycled..."
anonymous: "more, give us more of books like this. how hard can it be :D"